Surviving on the streets is not as simple as finding food and shelter. In the country of Cote d’Ivoire, the modern day version of Oliver Twist is the young man wearing brand name clothing in a flashy display of wealth. These conmen, also known as bluffeurs, exist on the fringes of a society where survival is dependent upon the ability to shift identity (Newell 15). Young men with limited financial resources spend more than half of their annual income on clothing in a masquerade of wealth (Newell 15). In the current Ivoirian cultural economy, deception based on artifice, is viewed as an artform and an act of national pride despite its connection to assimilation and the European colonization of Africa. Rather, it is an achievement in its own right that authenticates a man’s reputation by establishing the ability to make a living through artifice (Newell 261). Despite having arisen from a cross-cultural grey area, the manipulation of self-image, is neither fake nor real and has become a cultural phenomenon in its own right (Newell 261). Design research has taken an analogous path to the bluffeur, adopting its methods from the epistemologies of science and the humanities (see figure 1). Similar to the bluffeur origins which stem from the existing cultural conditions of Europe and “traditional” African, the first half of the 20th century of design research is indicative of an upwards trend in applied, multi-disciplinarity that utilized intuitive methods and scientific reasoning. A rapid growth in scientific design, or design-based on scientific knowledge reformed the field into a needs-based discipline (Cross 52). Domains such as behavioral science and material science engineering created industrial products such as ceramics and composite materials by utilizing design processes based on problem solving (see figure 2). Figure 2. Process model, based on the writings of JJ Foreman in 1967, of a problem-solution based methodology as an example of scientific design. Source: Dubberly, Hugh. “Problem, Solution.” How Do You Design? A Compendium of Models. Dubberly Design Office, www.dubberly.com/. Infographic. As a result, emerging schools of thought, such as the Bauhaus, were based on objectivity and rationality (Bremner and Rodgers 4). 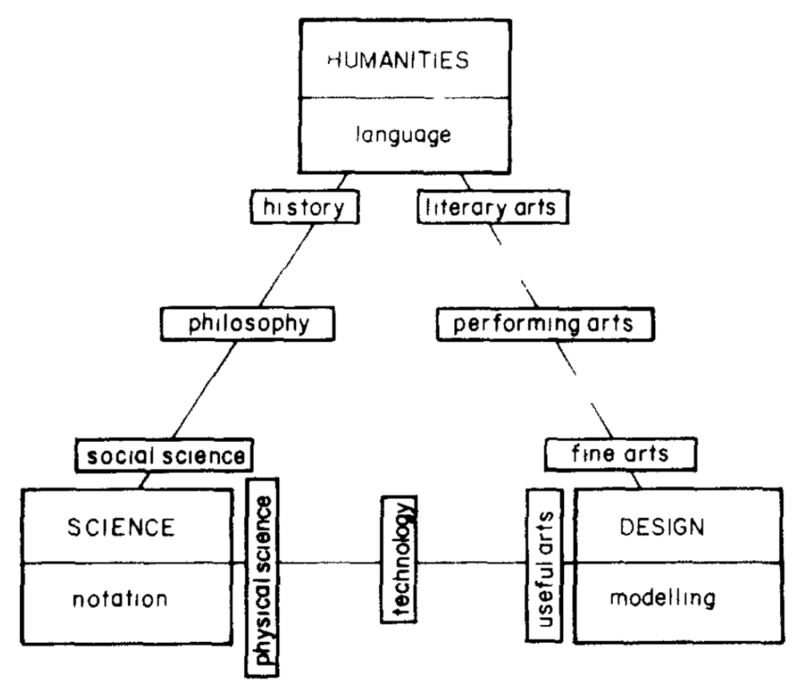 Although the boundaries between domains remained distinct, practitioners focused on collaboration between the humanities and sciences as they began to understand endeavors in relationship to other disciplines. Pressured by the academic “elite”, design experienced hierarchical, transcultural diffusion akin to cultural assimilation experienced by the Ivoirians. Assimilation occurred in Cote d’Ivoire due to attachment to the standards set by the socially elite Europeans (Newell 14). Likewise, in the 1960s, designers strove to differentiate themselves from artists and tradespeople by redefining themselves as intellectuals through assimilation of principles from science. As the concept of scientific design became mainstream, the focus shifted to scientizing the design process. Pioneers such as Buckminster Fuller, coined the term design science in reference to an organized, systematic methodology distinct from scientific design by approaching process as a scientific activity (Cross 52). The philosophy, related to the theory of logical positivism, asserts that the mind knows only actual or potential sensory experiences and suggests meaningful problems are those that can be solved by logic based on observation. Anything deemed unverifiable, such as ethics and ontology (the study of meaning) are cognitively inconsequential (Kitchener 37). Figure 3 represents a process based on the scientific method that logically connects knowledge in design and technical information from the environmental sciences to appropriate for application. Figure 3. Design science process model example from the environmental design teaching methodology of Cal Briggs and Spencer W. Havlick 1976. Source: Dubberly, Hugh. “Scientific Problem Solving Process.” How Do You Design? A Compendium of Models. Dubberly Design Office, www.dubberly.com/. Infographic. The incorporation of the scientific method is an example of the transformation of the field of design from multidisciplinary to cross-disciplinary where the character changed from a domain able to learn from other disciplines to one that can apply outside concepts. Rapid technological advancement created increasingly more complex issues (Bremner and Rodgers 11). Designers such as Dan Friedman responded by emphasizing the responsibility of designers to avoid specialization and view their work as creative endeavors at the systems level. In an increasingly global society, the delineations of traditional areas of study continue to dissolve. There are a number of causal theories such as: an increase in capacity for collaboration and technological advancement fueling globalization (Bremner and Rodgers 7). Regardless, the boundaries between disciplines are unraveling. 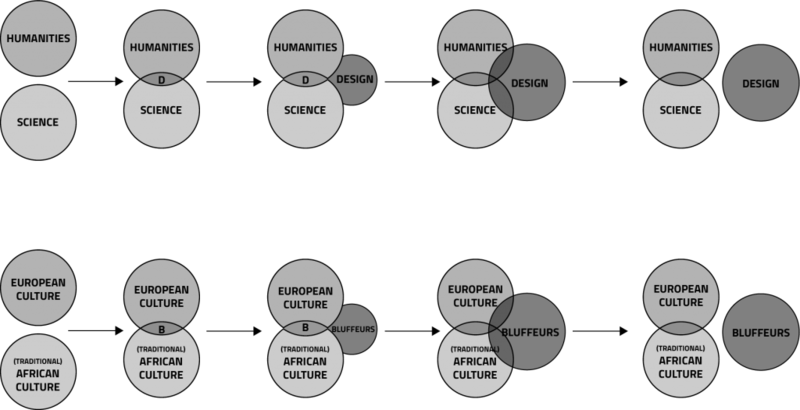 Figure 4 illustrates a transdisciplinary perspective between science, the humanities, and design where new concepts and artifacts result from the “grey-areas” between domains. Figure 4. Transdisciplinary map between design, humanities and science where an emergent perspective communicates new perspectives between disciplines. Source: Archer, Bruce. “Design as a Discipline.” IPC Business Press, vol. 1, no. 1, July 1979. Infographic. A transdisciplinary domain works congruently with at least one other area of study where neither predominates. This creates connections that blurs the distinctions between fields. This approach promotes an “undisciplined” practice where research becomes issue- or project-based (Bremner and Rodgers 12) and promotes the circulation of knowledge without worrying about the historical effect of canon. Both design and bluffeur culture exhibit competencies that straddle boundaries. Anthropologists such as Sasha Newell study social groups that exist outside of traditional cultural classifications. A situation without precedent and lack of published criticism poses problems in the anthropological canon. How does one study a culture that does not fit within traditional classification? Questions arise pertaining to the best methodology to approach unprecedented situations. This is the condition in which design currently finds itself as it struggles to validate its position as an academic field of study. In the article, Designerly Ways of Knowing: Design Discipline versus Design Science, Nigel Cross posits that, “We need to draw upon those histories and traditions where appropriate, while building our own intellectual culture, acceptable and defensible in the world on its own terms” (55). By its nature and history, design is not a canonical field. This raises the question of whether canon matters in determining value. In addition, academia is steeped in written tradition. Design, however, is unique in that it is not to be understood through verbal language alone. Communication extends beyond the realm of words and is expressed through a variety of media from bodily expressions to materiality. Although writing is a valuable tool, the focus on verbal language as the primary method of communication holds design back in academic circles. In the past decade, the discipline has focused on the validity of research methods (see figure 5) but perhaps focus needs to shift to presentation and communication. Figure 5. 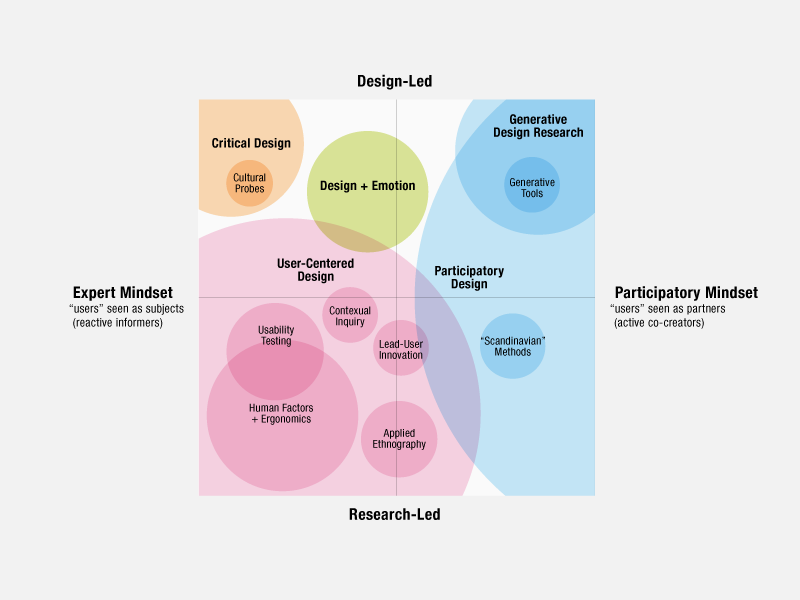 Graphical representation of the scope of research methodologies and underlying dimensions in the field of design. Source: Sanders, Liz. “An Evolving Map of Design Practice and Design Research.” ACM Interactions, vol. XV.6, Dec. 2008. Infographic. Design is unique to science and anthropology in that it sometimes considers the end-users as co-creators or active participants as illustrated in figure 5. What if this principle was translated to academic publication where the passive role of the reader is reconsidered? If design is a bridge between disciplines (figure 4), it should promote accessible communication. For example, the principles of universal design can be applied to the presentation of research to engage a broader range of learning styles. According to constructivist theory in developmental education, knowledge is not the acquisition of information but manufactured through experience (Ackerman 17). Perhaps creating active participation, whether through verbal instruction, tangible objects, and/or media, to articulate key concepts is vital to communication in design literature. According to Bremner and Rodgers, “. . . we need more playful and habitable worlds . . .” (11). Design has a unique history that creates challenges in core competency but also provides opportunity to redefine academia. Ackerman, Edith K. “Constructing Knowledge and Transforming the World.” A Learning Zone of One’s Own: Sharing Representations and Flow in Collaborative Learning Environments, IOS Press, pp. 15-37. Archer, Bruce. “Design as a Discipline.” IPC Business Press, vol. 1, no. 1, July 1979, pp. 17-20. Bremner, Craig, and Paul Rodgers. “Design without Discipline.” DesignIssues, vol. 29, no. 3, Summer 2013, pp. 4-13, doi:10.1162/DESI_a_00217. Cross, Nigel. “Designerly Ways of Knowing: Design Discipline versus Design Science.” The MIT Press, vol. 17, no. 3, Summer 2001, pp. 49-55. JSTOR, www.jstor.org/stable.1511801. Accessed 9 11 2016. Dubberly, Hugh. “Problem, Solution.” How Do You Design? A Compendium of Models. Dubberly Design Office, www.dubberly.com/. Infographic. How Do You Design? A Compendium of Models. Dubberly Design Office, www.dubberly.com. Kitchener, Richard F. “Logical Positivism, Naturalistic Epistemology, and the Foundations of Psychology.” Behavior and Philosophy, vol. 32, no. 1, 2004, pp. 37-54. JSTOR, www.jstor.org/stable/27759470. Newell, Sasha. The Modernity Bluff. U of Chicago P, 2012. Sanders, Liz. “An Evolving Map of Design Practice and Design Research.” ACM Interactions, vol. XV.6, Dec. 2008, pp. 1-7.